The first October Sunday – the Sunday about running, runners, breaking records, gaining medals, and having fun. 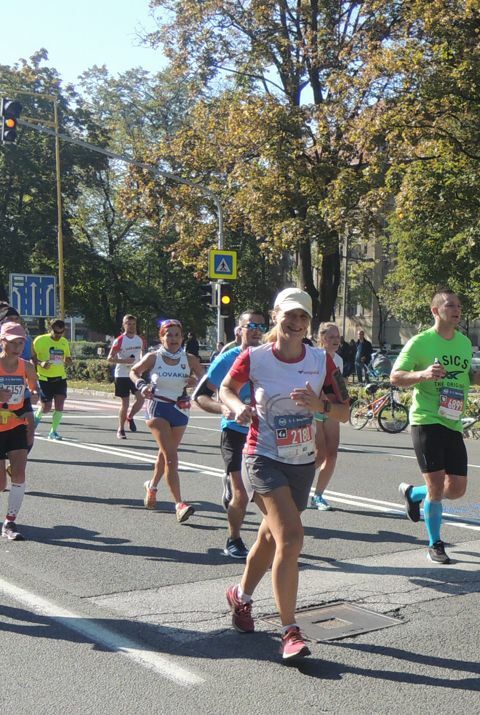 This year, Peace Marathon was dedicated to Emil Zátopek, a Czechoslovak runner, who became famous in 1952, during the Olympic Games in Helsinki, when he won the 5-kilometre and 10-kilometre races, and even the marathon race that he ran for the first time in his life. No one has ever beaten his gold hat-trick yet. Nearly 13,000 runners were prepared to start all well-known sports disciplines. We watched with great interest which of the Slovak runners, Tibor Sahajda or Jozef Urban, will finish first, and whether or not either of them will satisfy the time limit to qualify for the European Championship in Berlin next year. 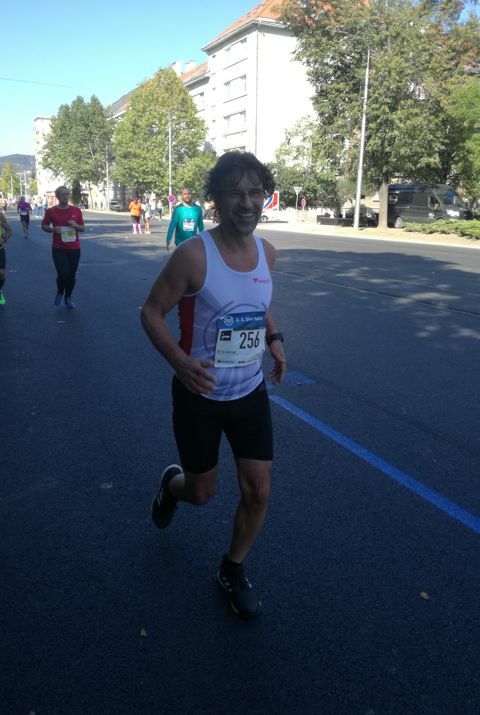 So, we know now that we will support Tibor Sahajda in August 2018, who will represent Slovakia as the first marathon runner at the top sports event after a long time. 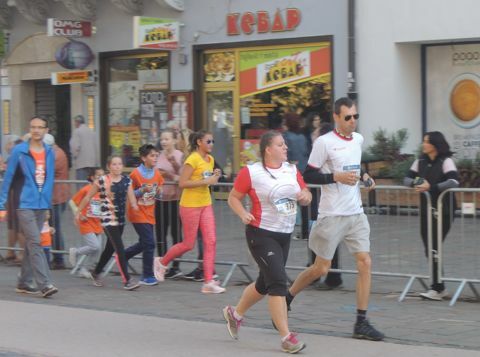 After a year of thorough preparations, Telegrafia´s running team attended the 94th Košice Peace Marathon. Sixteen colleagues from various departments ran the race in the company colours. 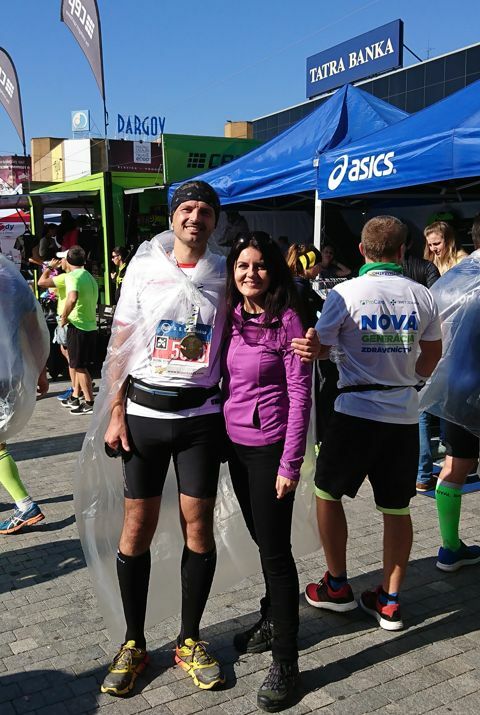 This year, we were represented even in the most challenging discipline: Peter Marcak, our general manager, decided to run the whole track of 42.195 km and succeeded with a beautiful time of 4:28:51. All hats off to him! Moreover, what do some runners say about the event? 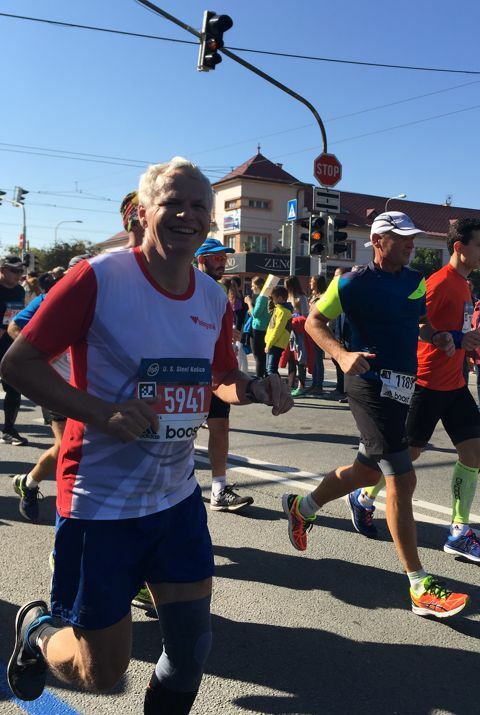 This year’s marathon run was a great event, like every time before. In comparison with all the previous ones, there should have been one big difference for me there. While I had always trained for only a few weeks before the race, aiming to finish it only, this year I planned to train longer, and I wanted to make some “good time” too. Unfortunately, I did not prepare according to my expectations and did not make the expected time either. So, even though I was going to “enjoy” this race on the half-marathon track in the next few years, I will have to repeat the same route in the near future. Honestly speaking, I am looking forward to it. This year I tried to run with professionals under the 4:00-hour flag. To my surprise, it went very well until the 18th kilometre. I ran smoothly, and the atmosphere was great as usual. At my age, the only thing I can say is that I am going to run again next year if I feel well. I finished the race, which makes me happy, but not the result so much. I have to train more and more. The atmosphere was amazing as it is every year, and the weather was great too. I can already say that I will definitely take part in the half marathon again. 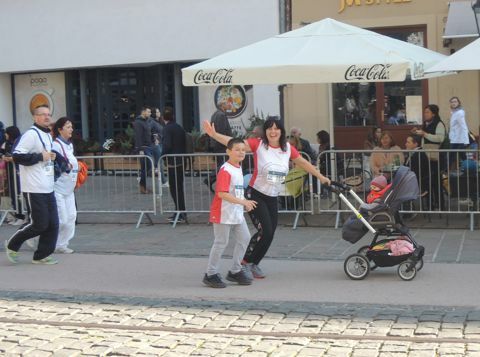 The atmosphere at the Peace Marathon in Kosice is unique every year: a massive crowd of runners running down Hlavna Street and trying to catch up with a small group of professionals at the front, crowds of spectators in the streets, almost perfect weather, and a joy of running. Those who have not experienced it will never understand. How did I run? Well, excellently, I was full of energy, and the crowd pulled me off as well, so I did the half marathon in the time that was better by 13 minutes than I had planned and aimed at. 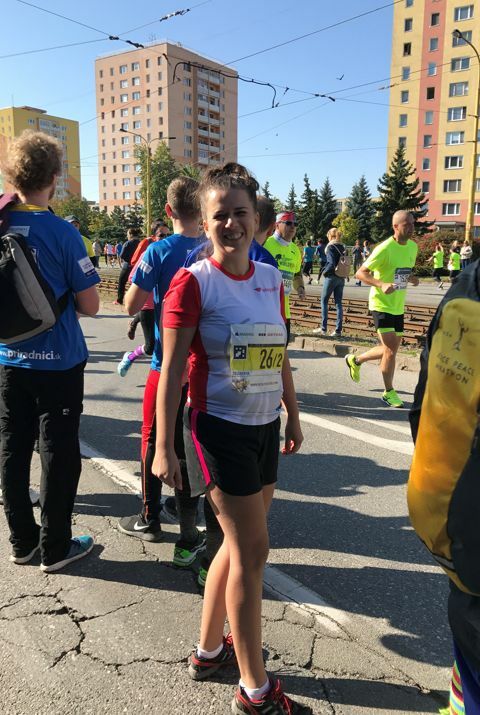 It felt like an obstacle race for the first three kilometres as I started at the back and had to make my way to the front through the running crowd. Gradually, I outran runner by runner, greeted my colleagues, and went on running at my own pace. I was happy I was able to attend the event this year. 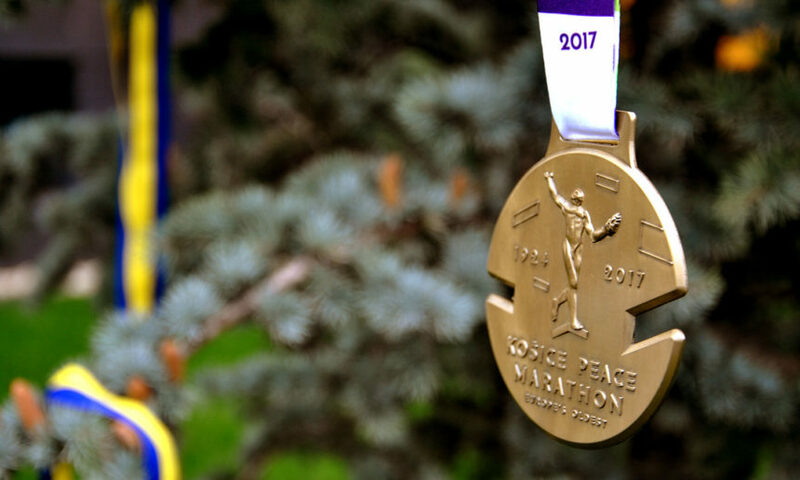 I have run at several races in 2017, but none of them can be compared with the Peace Marathon. A very emotional atmosphere, many runners and supportive spectators, perfect track, and excellent organisation, which were all multiplied by the ideal running conditions. It was just great. If it is possible, I will be back next year. I was running better than last year; even though, the final time did not prove that. I do not know now whether or not I will go running next year. We shall see if we can make a relay team again. I was a bit concerned this year because of my inadequate training, but I felt much better when running than last year in the end. I want to thank the whole team; we achieved our goal. I am looking forward to the next year’s run when we will not give a chance to our opponents again. I have trained less this year, so I persuaded my husband to run with me. We ran very well, and I even improved my time by one and half minutes compared to the last year. This year’s Mini-Marathon was my second one. What made me happy was that I was able to keep the same pace all the way and did not slow down a bit. I believe I will be getting better year by year. The atmosphere was fantastic, the people and musicians cheered us up greatly. The most pleasant were the meetings with my colleagues, whether on or off the track when we supported those who had decided to run longer tracks. I am pleased it is also a family run. In my opinion, every parent should take their child to a mini-marathon run at least once. It is inspiring for children, mainly because they can see that it is possible to finish it and succeed.